There are many other miscellaneous factors which can contribute to headaches and migraines; and the mechanisms of how each might bring on an attack of head-pain are not always fully understood. Listed below are some other commonly reported factors which can bring on attacks of migraine and headaches; and remember that it is always recommended that your problems be fully investigated and diagnosed before dismissing any other potential causes. Remember too; that most headache and migraine sufferers do actually have a combination of factors interacting to produce their attacks, not just one isolated problem. This is thought to have an effect on blood pressure, and is often reported as a trigger by sufferers. Hyper tension induced headaches are a well known phenomenon. Cases in which blood pressure problems are suspected should be addressed immediately, as the blood pressure itself needs to be addressed to prevent more serious long term complications. Especially radiant heat (ie:through direct sunlight) is thought to have a dilating effect on the blood vessels of the head and neck regions. This will also have an effect on blood vessels, but can also serve as a trigger in cases of ‘neuralgia’ & cluster migraines by having a direct effect on sensitive nerves. Some smells have been reported as common triggers for various sufferers. Perfumes, deodorants, pollution, cooking smells, and various odours have been reported as triggers; amongst others. Especially loud noises, have been reported as provoking attacks of headaches and migraines in sound ‘sensitive’ individuals. A number of possible mechanisms could explain how oversleeping may bring on attacks of head-pain; certainly a drop in blood sugar levels may result due to a delay in eating. Fatigue is also a common trigger for head-pain. 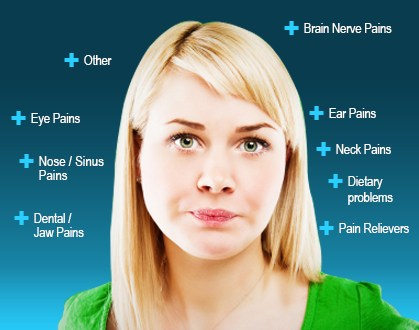 There are many other poorly understood, but well documented ‘miscellaneous’ causes of Headaches and Migraines. For more information on these, consult your family doctor.